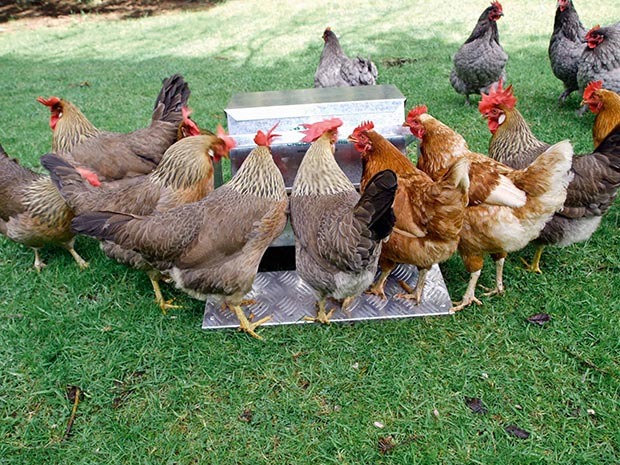 When Bill ‘Grandpa’ Kirkham came up with a good idea for a chicken feeder, he had no idea it would turn into a family-run multi-national business, Grandpa’s Feeders. 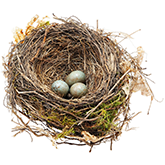 When you own poultry, something is always trying to steal their feed: rats, mice, wild birds. 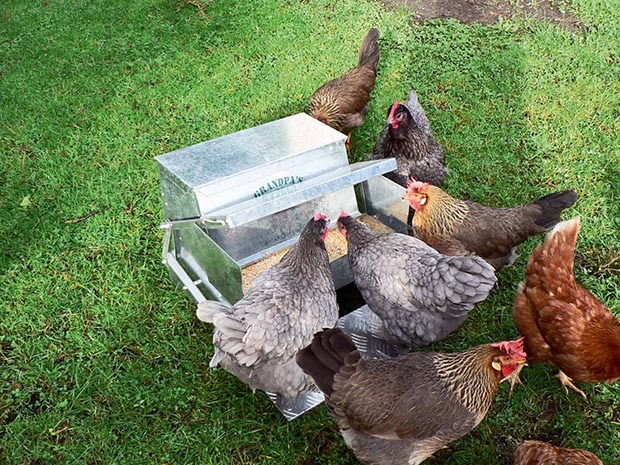 Trying to stop the thieves and varmints turned from a challenging project for retired farmer Bill Kirkham into a multi-national business for his family, who now sell their automatic chicken feeders around the world. Bill used to be a dairy farmer and he always liked tinkering. One of his daily frustrations was the amount of chicken feed he lost to roaming rodents and cheeky sparrows from the containers in his hen house. “It was driving him nuts,” says his son Mark, who with wife Alla now runs the business that started in Bill’s workshop. 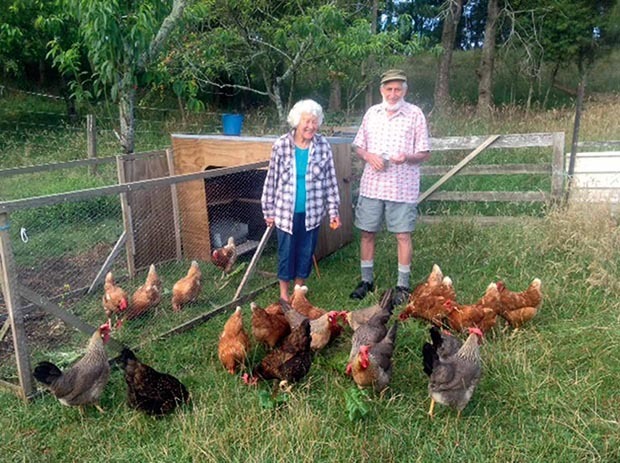 Jean and Bill ‘Grandpa’ Kirkham with their flock. Bill fixed the feeder with bits of tin but had to keep mending it until he realised he needed to make the whole thing out of sheet metal. Once construction was finished to Bill’s satisfaction, he lent it to the mate who’d given him the wind-up. Two weeks later, the mate told Bill he wouldn’t be getting his feeder back, and by the way, he wanted two more. The feeder’s popularity slowly spread by word of mouth and Bill made them in his spare time out in his shed, two or three a month, selling them at close to cost. As orders grew, Mark worked with him, but after two years, the novelty of building them by hand had worn off and Bill was ready to give it up. Mark says that’s when he knew they had to make a big decision. Bill’s biggest problem: he wasn’t making any profit. Mark decided to go for it, upping the price of the base 18kg feeder model to $180, and introducing a second smaller feeder that held 9kg of food. His father was unconvinced people would pay that much. Their first show was the Mystery Creek (National) Fieldays in 1999. “I had very little experience of sales myself and I must admit I was freaking out the day before the show. and I sold only eight feeders. 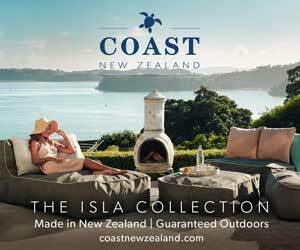 In typical Kiwi fashion, the new venture got help from all sorts of unexpected quarters. 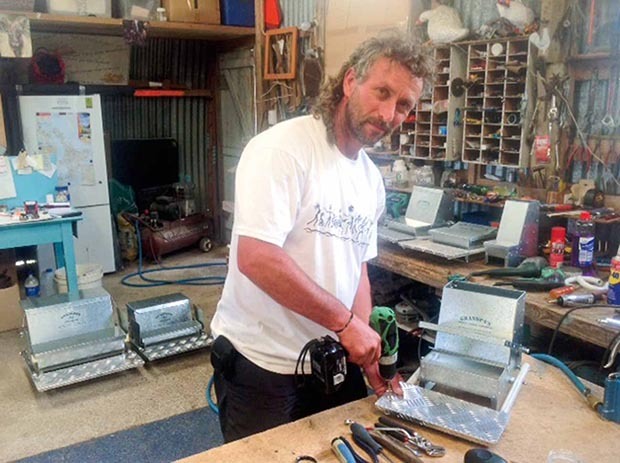 A boatbuilding friend in Tauranga let Mark learn new skills in his workshop. An engineer cousin assisted with some design aspects. Other family and friends offered support. “Those people who helped us get off the ground look back now at where we’ve got to and are pretty surprised and delighted, just like my Dad, he can’t believe it, he finds it astonishing what we’ve done. Since its small beginnings, the company has gone from strength to strength. In 2012 Grandpa’s Feeders sold 200 units at the National Fieldays, and it was just one of dozens of events that Mark and Alla attended, including shows in the UK and Australia. 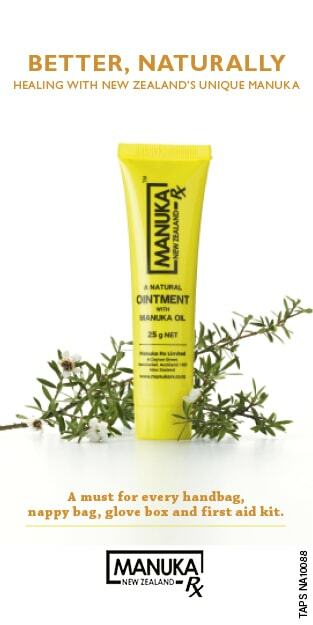 The company may now send its products around the world, but its base is still the family home on neighbouring lifestyle blocks near Tauranga. Bill and his wife Jean have 4ha, next door is grandson Caleb and his wife who live on Mark and Alla’s block and help dispatch the products, and next door to them is Mark’s brother and his family. When the couple let their house to Caleb and his family to live in, they bought themselves a purpose-built caravan which they live in permanently. They spend up to four months of the year travelling to A&P shows and field days. Mark building a feeder in the early days. 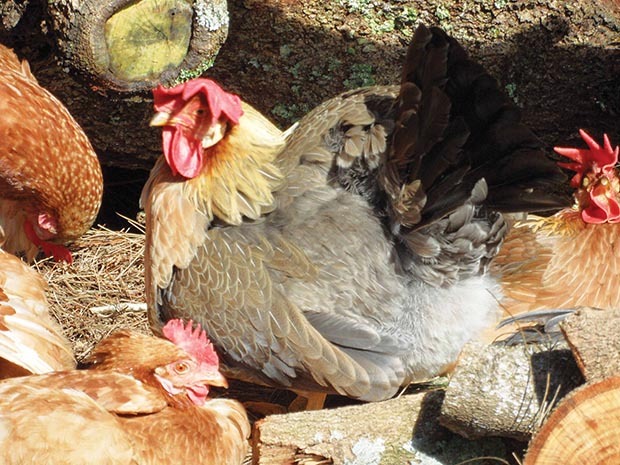 The couple spends much of their time on the road selling their products in person to poultry keepers in NZ and Australia who all have the same problem: the loss of large amounts of chicken feed to rodents and birds. The rapid expansion of the business meant that construction of what had been until then a home-built product was out-sourced in 2007. Orders coming in from all over the world and a lot of competition from similar products meant it was a hard but necessary step in the life of their business. “That was a huge challenge for me, seeing it was my responsibility (for manufacturing),” says Mark. That meant finding a reliable Chinese manufacturer which would do a good job. Again, it was fellow Bay of Plenty business owners who stepped up to help out. Running a company with clients all over the world was a big change for a man who says he had been a “transient worker and an opportunist”. Mark’s background was mostly in horticulture, managing a sandersonia nursery, growing tamarillos, pruning and managing kiwifruit orchards in the Bay of Plenty. Taking on the role of marketing was a whole new experience. Becoming a full-time entrepreneur and marketing man was something Mark says he’s had to work hard at. The fun factor is higher still because of the feeder’s humble beginnings. “When my Dad designed it he just got it right, he was pretty clever and he got a bit lucky, but people liked what they saw, they’d never seen anything like it. A big part of it is that it’s a really neat product – when we go to do shows, so many of our customers come back to tell us it’s a great product, how wonderful it is.” The full-time effort of selling the feeders saw the company grow rapidly, with investments in print advertising and then a website paying dividends. “To start with it was a long, slow, hard journey, but for us it has been about trying to make our marketing money count.” One of the biggest challenges the company has faced is coping with the influx of ‘copycat’ feeders that don’t work very well, taking advantage of the market the Kirkham’s product has created. It’s another reason the local A&P shows are such an important part of their marketing. 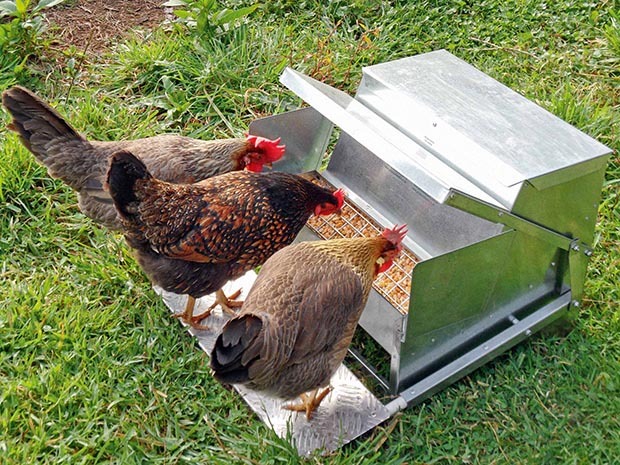 Customers get to see the differences for themselves and know that when they buy a Grandpa’s Feeder, it includes a tried and tested two-week-long training programme for their flock so birds get used to the interactivity of the feeder and its pop-up lid. 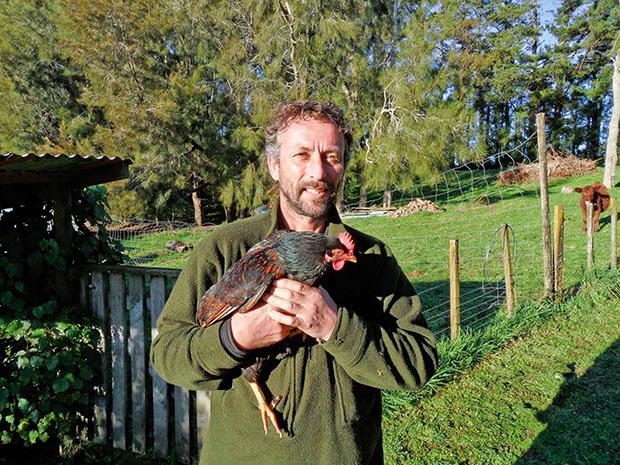 “One of the big things was that people often couldn’t believe their chooks were trainable. Nnice as they are, they’re not the cleverest creatures. Dad had a cunning plan, he went through a lot of trial and error and we’re still using the same (training) systems. 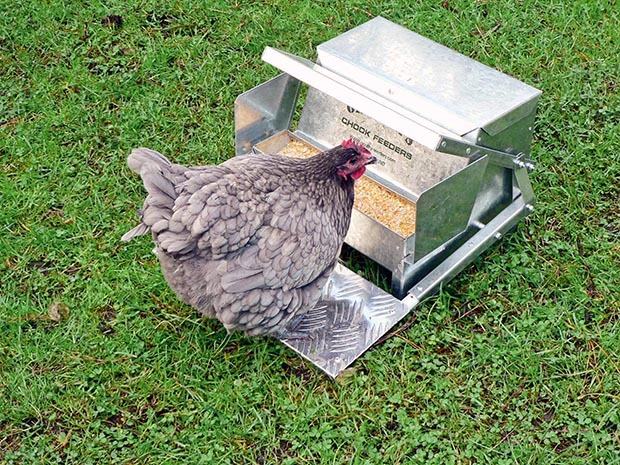 One innovations was a grill to stop hens wasting feed as they peck in the feeder bin for their favourite morsels. 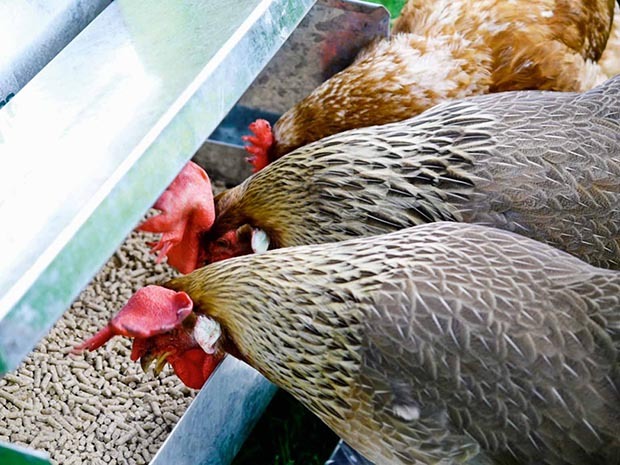 “Some people give their chooks a mixed feed, they might add wheat or maize to pellets… if a hen likes a particular seed, to get to the bit they prefer they flick it with their beaks and chuck it on the ground. The grill stops them doing it, and the idea came from a customer – they showed us what they did and how they solved the problem. 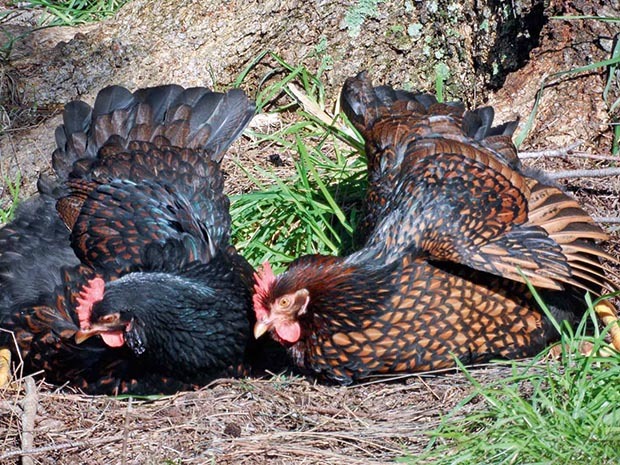 That has meant Bill and Mark spend a lot of time observing their poultry, one of their favourite pastimes. Running their business has taken on a new direction now they have their caravan and Alla can run her side of the business remotely using a laptop and iPad. “We are away from home so much… we quite enjoy towing it around the countryside, it’s a pretty big unit, our home away from home. Every time we park up, we’re home again. 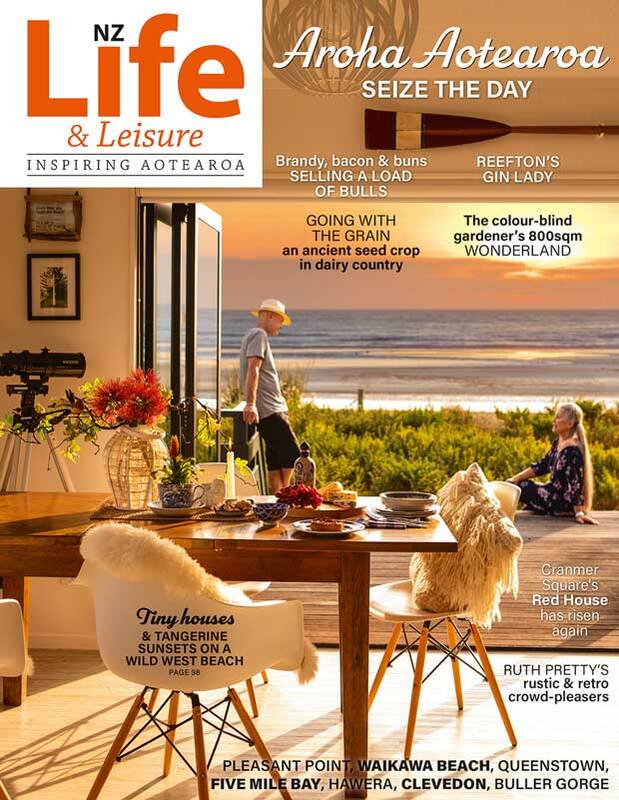 “If you have a look at what we’ve done (recently), we’ve got the balance pretty good: we’re carrying a fishing kayak, my wife has her scuba gear for catching crayfish, we went to Kaikoura and went snorkeling for paua, I shot a couple of stags at Nelson Lakes, we caught some trout – I got one, she got seven. Despite all their success, Mark says the biggest thrill is still meeting their customers face-to-face. “It’s really neat to be selling something that people really get a kick out of, when people come up to you and say ‘it’s the greatest thing I’ve ever bought’ while you’re trying to sell one to someone, the (buyers) ask you ‘how much did you pay them to say that?’. 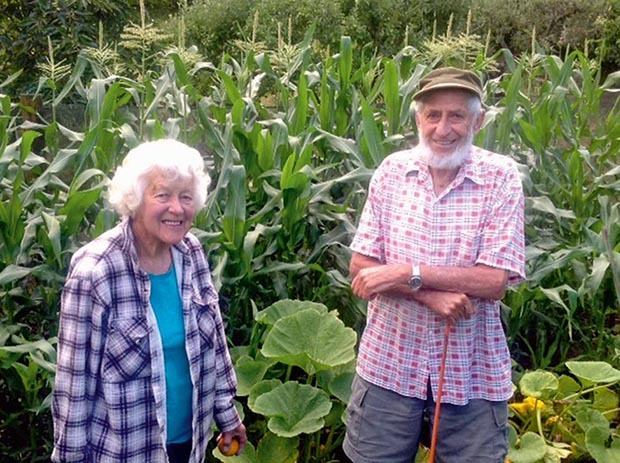 Bill ‘Grandpa’ Kirkham might have finished farming professionally, but he’s not ready to leave the land and you certainly couldn’t say he and Jean are retired either. “They’re certainly kicking back,” says their son Mark. “But mum sea kayaks, she has a massive garden, she’s pretty motivated. “Dad is happy to sit back and cruise, he prefers to be on the farm – he doesn’t want to live in town – so he keeps a few cattle, rears a few calves, he grazes my property too because I’m always away. TAKING GRANDPA’S FEEDER TO THE WORLD? When the company made its first foray into the UK to do a show, they worked very hard but only sold a small number. Their second attempt was with a small company based in a rural spot near the Welsh border, run by “traditional Englishman” Richard Allum. Mark, Alla and business partner Graham flew to the UK to attend a show and train Richard on how to sell the feeders. “We took him banners, did a three-day show, showed him the ropes, showed him how we did it. We had a cracker show, the Welsh loved it – they have very similar problems, not so much sparrows, in places like that it’s pigeons and rooks, crows and rodents. When they decided to try selling in the USA, it was another local Bay of Plenty business that turned out to be their best contact. 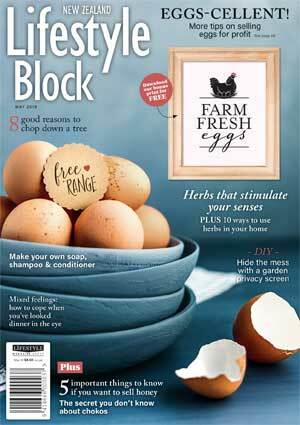 One of the successful investments in recent years for the Kirkhams has been the company’s website, www.grandpasfeeders.co.nz and its Australian, UK and US versions, but supplying their product to retailers has been their latest focus. “We originally thought everything was going to be done over the internet and we didn’t need shops, but that hasn’t been the case. We realise now you need to be in shops because there’s a certain percentage of people who only shop that way. The company’s website was designed by a professional website development team, and the Kirkhams now also contract an agency to manage the marketing workload. “We’re always looking for ways to improve, and now with so much competition we’re looking for an edge,” says Mark. “We’ve got our product in four countries so we can certainly justify employing experts in some areas. “I do go on about it a bit, but it’s all about marketing. I’ve seen some really neat products that have failed because their marketing hasn’t been up to scratch and for every one of those I’ve seen some junk that’s sold really well because of good marketing. Selling their feeders has taught the Kirkhams that people don’t buy it just because it saves them on the cost of pellets or mash.